Each year groups of certain animals move from one place to another. Some may travel thousands of miles in the spring and then thousands of miles back in the fall. These long trips are called migrations. Animals migrate with the change of the weather and the seasons. They migrate to find warmer weather, better food supplies, or a safe place to give birth to their young. Different signals such as a change in weather, the length of the days, or the availability of food may signal to the animals that it is time to move. As to how they know which direction to go, scientists aren't sure. Many think that animals know where to migrate to when they are born. Scientists say they learn this "genetically" from their parents. It is also called instinct. How do they find their way? Animals don't have the internet, GPS, or even maps to find their destination, yet each year they manage to find their way across thousands of miles of land and sea. Different animals have adapted different ways of navigating the Earth. Some animals use the Sun and the stars to figure out the correct direction. Other animals use wind patterns or landmarks such as mountains, rivers, and lakes. Still other animals may use an extra sense that allows them to use the magnetic field of the Earth to know which direction to go. It is amazing what animals can do! Below are some examples of animals that migrate across the land, air, and sea. Caribou - Caribou live in the snowy tundra of the far north. In North America they migrate each spring to the northern coast where they birth their calves in the summer. When fall arrives they migrate back south to below the Arctic Circle. Some caribou herds migrate as far as 3,500 miles traveling as much as 35 miles per day. Zebras and wildebeest - Each year the zebra and wildebeest herds of the African savannah migrate in a giant clockwise circle. They are constantly moving. This giant circle follows the rainy seasons when food in certain areas is plentiful. Arctic terns - Arctic terns make the longest migration of any animal in the world. Every six months they travel from the northern Arctic all the way across the planet to Antarctica. Then back again six months later. The roundtrip distance is close to 50,000 miles! Fortunately, terns are strong and fast flying birds. They can make the trip in about 40 days. Canadian geese - Each year Canadian geese fly south for the winter to avoid the winter freeze of lakes and ponds. Then they return to the north for the summer where they breed and nest. 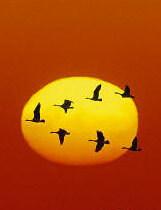 Geese are known for their V formation when they fly. This helps them to save energy and allows them to fly up to 600 miles in a single day. Gray whales - Gray whales migrate between the cold northern waters of the Bering Sea in the summer, and the warmer waters of Baja California in the winter. They give birth to their calves over the winter and then head north again at the start of spring. They travel around 5,000 to 6,000 miles. Salmon - Salmon have a unique round trip migration that they make once during their lifetime. When they are born they hatch from an egg in fresh water. Then they grow and eventually swim downriver and live the majority of their lives in the ocean. When it is time for them to spawn, they return to where they were born to lay eggs. Soon after laying eggs, they die. Some salmon migrate hundreds of miles up river. The Chinook salmon swim 900 miles up river and climb nearly 7,000 feet of altitude when making their migration home. Many animals prepare for migration by storing up energy reserves and even exercising certain muscles so they will be strong enough to make the trip. The average arctic tern will travel the equivalent of going around the Earth 60 times in their lifetime. Birds save energy and are able to travel great distances by riding the air currents. Male and female walruses migrate in separate herds. Sea turtles migrate back to the same beach where they were born to lay their eggs. Emperor penguins, who are excellent swimmers, walk across 125 miles of ice each year to the place where they birth their chicks. Migrating flocks of European white storks can stretch for lengths of up to 125 miles.